To say that I’m psyched I’ve discovered pronoun would still be a massive understatement. Her music is a breath of fresh air that makes you feel things. The minimalistic production elements of songs like til your legs give up or a million other things are hyper-effective in giving you that feeling that anything is possible and at the same time that life is a mystery. I absolutely can’t wait for pronoun’s debut album “i’ll show you stronger” to drop on May 24th, after we we already got a taste with “stay” and recently the brilliant “temporary tantrum”. 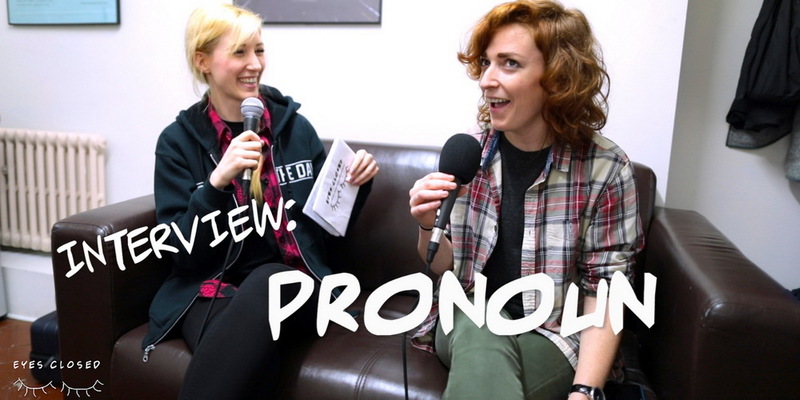 I had the chance to get to know the master brain behind Operation pronoun, the ultra-talented and hilarious Alyse Vellturo – who characterizes her music as ‘indie emo bedroom rock that nobody asked for’ – ahead of the show at London’s Troxy in support of Mayday Parade. Watch us fangirl over Jimmy Eat World and Julien Baker, talk about ‘fully realized sadness and half-realized self worth’ and The Great British Bake Off. German-bred, London-based, not American. Likes high quality banter and video interviews with a dash of photo pit. Sad songs are the best songs, especially within pop-punk, emo & alternative. Andrew W.K.’s party tips should be anyone’s life philosophy. Does not care that you hate her favorite band, Canadian pop-punk legends Simple Plan. Fight me.